Squishable Seal: An Adorable Fuzzy Plush to Snurfle and Squeeze! The cuddles it gives are so neat! I appreciate a kiss from a Seal on the couch! The better it feels, yeah! It makes me never want to roam! Really cute! 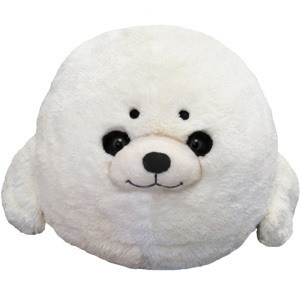 I love seals, and would really suggest this squishable for any seal fans! Although I have one small problem with it, the black around the eyes makes it look too panda-like. But that is not a big deal! This seal is truely a wonder. It is so large and so soft, and REALLY huggable. I got my squishable seal for christmas, he was my favorite gift. I absolutely adore him! It took a while to get my seal (it's always out of stock!) but it was well worth the wait. It's not quite as stuffed as most of the other Squishables which makes it easier to hug, and its face is even cuter in person! I'm so glad I was finally able to get one of my own. It was a long way to get this little guy. He's always busy, popluar and sold out. But now, here is Mika! I want always a cute fat baby seal. My boy's favourite are strawberrys, mangos, kuddles under a view warm blankets and he loves to play with all my other Mini Squishables. He's everyones granddad. I got "Harper" (you know, harp seal-- oh, forget it), two years ago, and I'm still in LOVE! He was my birthday gift to myself, and a way to deal with home sickness while away at school, and still one of the best purchases I've ever made! He's so unbelievably soft, and well, squishly! He looks exactly like his picture as shown, and I absolutely love the shape of him too, because I can either prop myself up on him while writing a paper, or cuddle whenever I'm feeling lonely. LOVE. LOVE. LOVE!! !